POLY-CLEAN™ is a revolutionary safe product which quickly and easily removes residual sticky, gel-type support materials from photopolymer 3d printed objects. 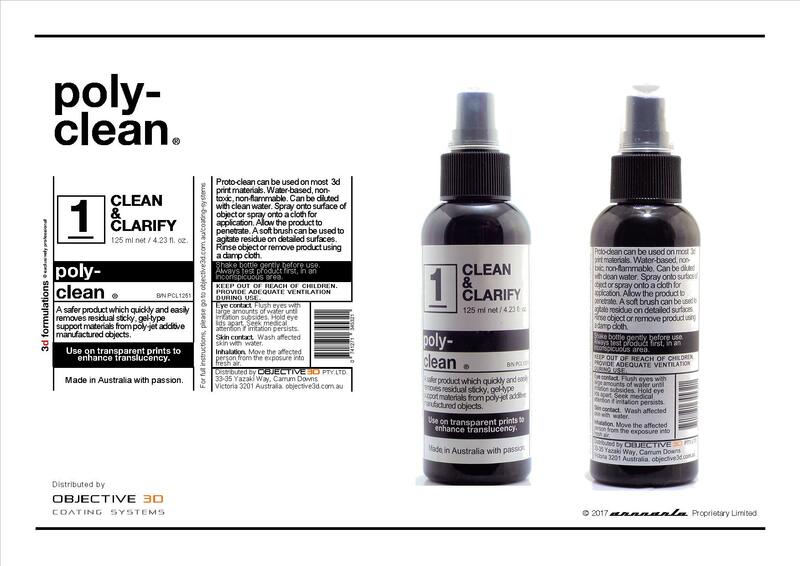 POLY-CLEAN™ can be used on most 3D print materials. Water-based, non-toxic, non-flammable. Can be diluted with clean water. Spray onto surface of object or spray onto a cloth for application. Allow the product to penetrate. A soft brush can be used to agitate residue on detailed surfaces. Rinse object or remove product using a damp cloth. POLY-CLEAR™ is a specialised, ultra-high gloss, clear coating formulated to greatly enhance the gloss and translucency of clear 3d printed objects. 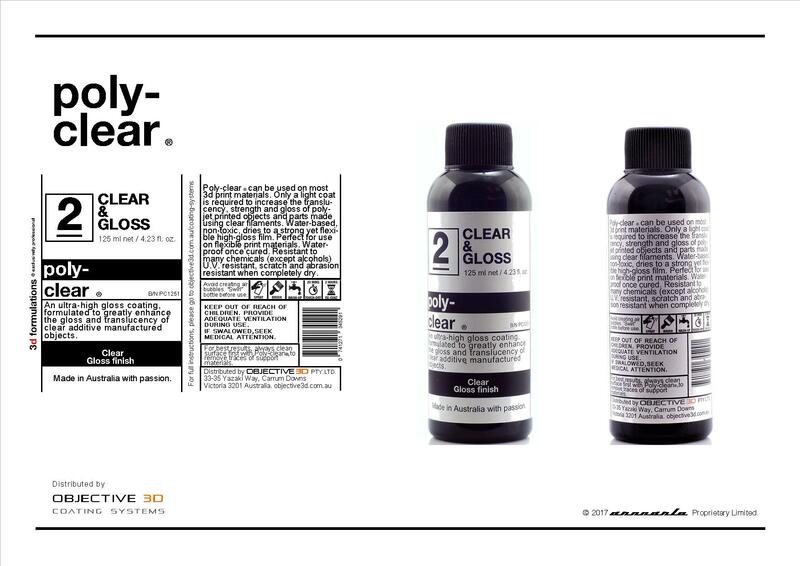 POLY-CLEAR™ can be used on most 3D print materials. Only a light coat is required to increase the translucency, strength and gloss of photopolymer printed objects and parts made using clear filaments. Water-based, non-toxic, dries to a strong yet flexible high-gloss film. Perfect for use on flexible print materials. Water proof once cured. Resistant to many chemicals (except alcohols), UV resistant, scratch and abrasion resistant when completely dry. 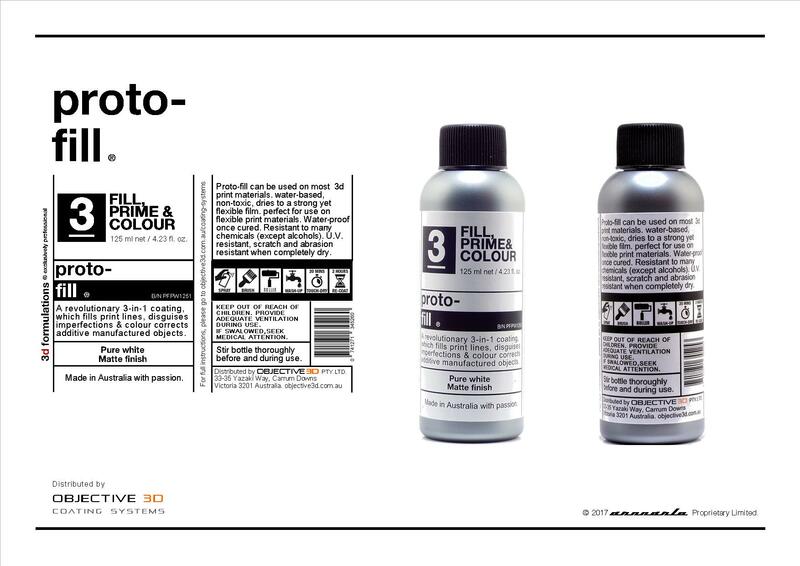 PROTO-FILL™ is a revolutionary 3-in-1 coating, which fills print lines, disquises imperfections & colour corrects 3d printed objects. PROTO-FILL™ can be used on most 3D print materials, water-based, non-toxic, dries to a strong yet flexible print materials. Water proof once cured. Resistant to many chemicals (except alcohols), UV resistant, scratch and abrasion resistant when completely dry. PROTO-COLOUR™ is a functional colour coating formulated specifically for 3d printed parts and post-finishing 3D prints. 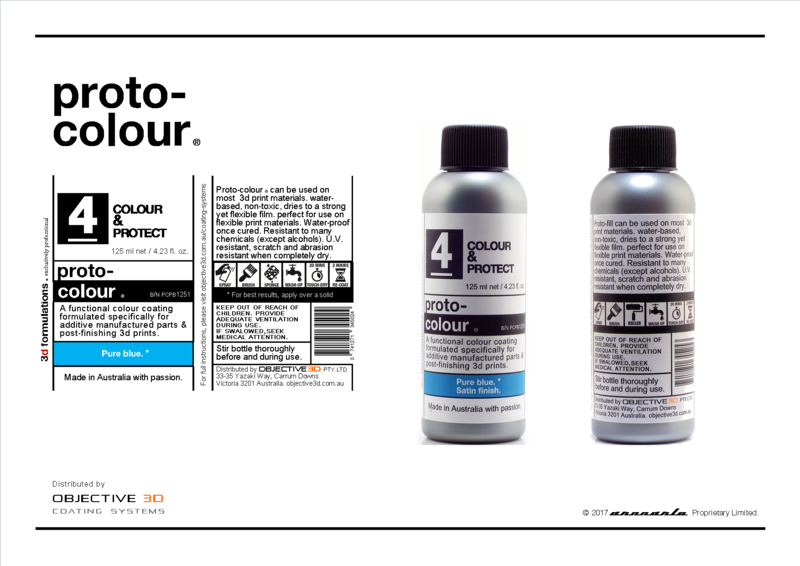 PROTO-COLOUR™ can be used on most 3D print materials, water-based, non-toxic, dries to a strong yet flexible print materials. Perfect for use on flexible print materials. Water proof once cured. Resistant to many chemicals (except alcohols), UV resistant, scratch and abrasion resistant when completely dry.